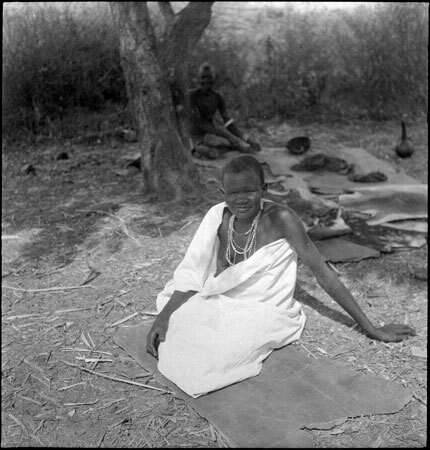 A portrait of a woman wearing a body cloth and bead string neck ornaments, kneeling on a mat. Another woman sits in the shade of a tree in the background. Morton, Chris. "Portrait of an Anuak woman" Southern Sudan Project (in development). 03 Jan. 2006. Pitt Rivers Museum. <http://southernsudan.prm.ox.ac.uk/details/2005.51.376/>.